Long Beach, Calif. – June 1, 2013 – Formula DRIFT presented by GoPro returned to Palm Beach International Raceway for Round 3: Invasion. Michael Essa in the GSR Autosport / Yokohama Tire BMW M3 takes the victory and moves into third place overall in the standings. Round 3: Invasion returned for the third consecutive season to South Florida to a capacity crowd. The fans were treated to exciting on-track action intermingled with the Slammed Society car show and display of cars from the Targa Trophy. The skies cleared up for the main event day and the crowds flocked to the venue. The technical track featured a fast entry that proved to be a challenge for some of the drivers with many favorites failing to enter the later rounds of competition. The consolation round pitted Robbie Nishida in the Bridges Racing / Achilles Lexus SC300 against Vaughn Gittin in the Monster Energy / Nitto Tire Ford Mustang. After failing to reach the line after a Competition Timeout following mechanical problems from the previous round, Gittin conceded to give Nishida the win and third place. The final battle pitted Michael Essa in the GSR Autosport / Yokohama Tire BMW M3 against returning champion Daigo Saito in the Bridges Racing / Achilles Tire Lexus SC430, who also won this event last season. The battle was fierce, but Essa took the victory after Saito had a slight error in his chase run. 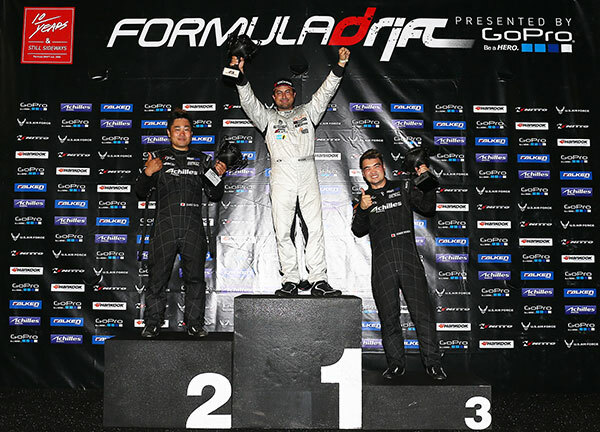 This is Essa’s first Formula DRIFT pro championship podium and victory, which moves him into third place overall in the standings. Saito in the process moves into first place overall with Gittin closely behind him in second place.